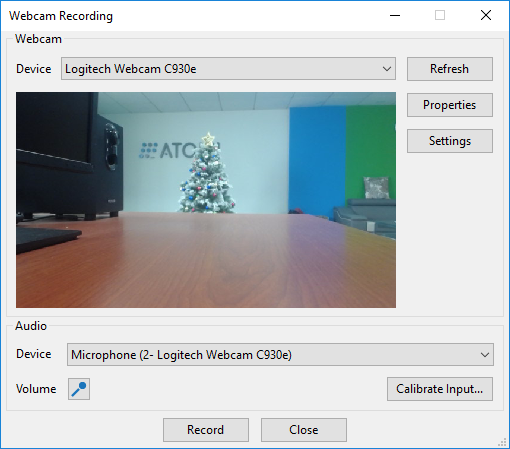 Recording Webcam in ActivePresenter 7 - Atomi Systems, Inc.
With ActivePresenter 7 – professional screencast software, you can record webcam and screen simultaneously. This is a handy feature for creating video demos, how-to videos or interactive eLearning courses where visible instructions needed. 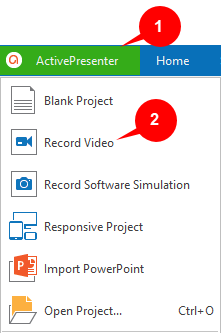 Besides, ActivePresenter 7 also allows you to record webcam separately and save videos to use in your projects. Let’s get to know how to do that in this article. Recording webcam and screen simultaneously is critical especially in recording video demos. With this feature, you can record screen with all the actions and sound happened along with your voice if needed. To record screen and webcam together, firstly, you have to access the Record Video function. Remember that if you select Record Software Simulation, recording webcam is not available. In other words, you cannot record screen and software simulation simultaneously. Step 2: Select Record Video (2). After that, ActivePresenter will launch a blue rectangle and a Recording Video Project dialog where you can access the Webcam Recording feature. A completed tutorial about how to record a video demonstration is available on our tutorial page, feel free to take a look for more details if needed. In this tutorial, we will only focus on the Recording Video Project dialog. Step 1: In the Record Video Demo Project dialog, click the drop-down arrow on the Webcam button (3). Step 2: Select a webcam device from the webcam list. Then, a live preview of the camera will appear next to the webcam option. ActivePresenter allows you to have many settings for the webcam. 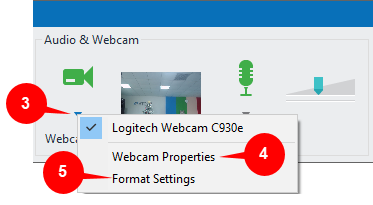 Click the drop-down arrow on the Webcam button (3) and select Webcam Properties… (4) or Format Settings… (5) to open corresponding dialogs. They will be discussed in details in the later part of this article. 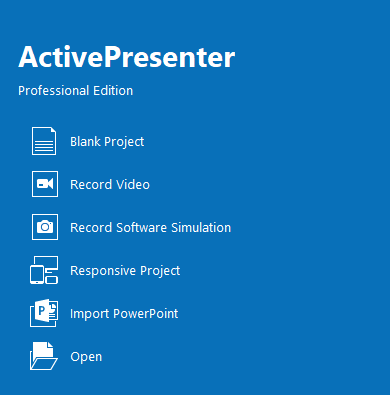 ActivePresenter 7 allows you to record webcam and screen separately. This means that you can record webcam, save videos, and insert them into slides to use in projects. Note: Webcam videos are treated as normal videos, so you can take advantage of many video editing tools such as cut/crop/insert time, etc., to enhance them if you want. Step 1: Open the Annotations tab (6). Step 2: Click the Video button (7). Step 3: Select Webcam Recording (8). The webcam section contains a live preview and many other setting options. Select a device detected from the Device list. 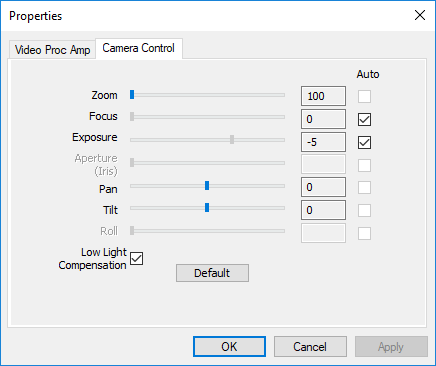 Click the Properties button to show the dialog for webcam properties settings. These setting dialogs will be explained in the Webcam Settings section. Click the Volume button to change the audio input volume. Click the Calibrate Input… button to calibrate audio input. ActivePresenter allows calibrating the sound level before actually recording to make sure that the sound level is good enough. Detailed information about this feature can be found in Calibrating Audio Input and Creating Video Demonstrations. Normally, Webcam Recording feature in ActivePresenter 7 has default settings that are ready to go. However, you can have further settings and changes when needed. Drag the slider to the right or left to increase or decrease the values in this dialog. Brightness: Brightness level that adjusts the amount of lighting on the image. Contrast: Contrast level that adjusts the difference between brightest and dimmest areas in the image. Hue: Hue setting that adjusts the color tint of the image through the red-yellow-blue spectrums. Saturation: Saturation level that adjusts the amount of color in the image. Sharpness: Sharpness level that adjusts the clarity of the image. White Balance: Color temperature in degrees Kelvin. Backlight Comp: Configure backlight compensation modes to adjust the camera to capture images dependent on environmental conditions. 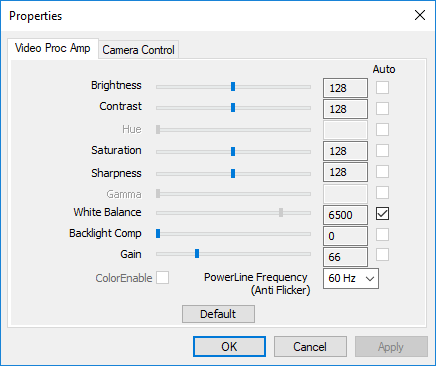 Gain: A multiplier for the RGB color values. ColorEnable: Specify the color enable setting. Zoom: Control zooming, measured in millimeters. Focus: Set focus, as the distance to the optimally focused target, in millimeters. Exposure: Specify exposure, in log base 2 seconds. Aperture (Iris): Specify iris setting, in units of f-stop x 10. Pan: Control panning, measured in degrees. Tilt: Control tilting, measured in degrees. Roll: Control rolling, measured in degrees. Low Light Compensation: Configure light compensation modes to adjust the camera to capture images. Frame Rate: Change the recording frame rate for webcam. 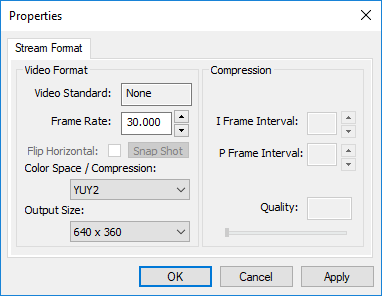 A higher value will make the motion in the video smoother but larger file size. Color Space: Select one from two default values for this option. Output Size: The dimension of recorded video. When finishing recording webcam and screen simultaneously, the result you get is a slide that displays the captured video with the webcam video placed at the bottom-right corner. The webcam video is also a video object, you can edit it as a normal video and drag it to any position you want. The webcam video should not have too large in size, otherwise it may cover the important content of the recorded video. That’s how to record webcam in ActivePresenter 7. From now on, you can use ActivePresenter to record webcam and screen simultaneously to create professional training videos. You can also use this feature to create interesting eLearning courses with visual instruction included. I hope that you enjoy the tutorial and feel free to contact us if you have any obstacle.